President & CEO of the Vancouver Academy of Music, Joseph Elworthy has been a featured soloist, recitalist, and chamber music performer on such stages as Alice Tully Hall, Suntory Hall, Carnegie Hall, the Library of Congress, and Sejong Hall. Mr. Elworthy has been named a Fellow of The Royal Conservatory of Music for his extraordinary contribution to Canadian Arts and Culture, an honor he shares with such cultural icons as Oscar Peterson, Robertson Davies, Adrienne Clarkson and Leon Fleisher. His recordings can be heard on EMI, Sony, Archtype, Naxos and Bose record labels. In addition to receiving the Sylva Gelber Award of $15,000, Joseph has been the recipient of multiple Canada Council career grants exceeding $50,000. 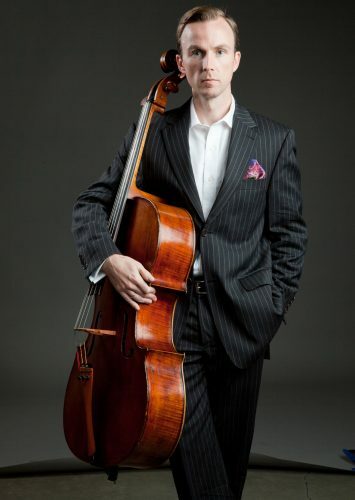 Mr. Elworthy is a graduate of the Juilliard School and Yale University where he was the recipient of the Aldo Parisot – Yo-Yo Ma Prize – the highest honour issued by Yale University to a graduating cellist. Mr. Elworthy has been a visiting artist at the Beijing Conservatory, Harvard University, Royal Northern College of Music, Glenn Gould School, and the Royal Conservatory of Music. Joseph Elworthy co-founded the Koerner Piano Trio, the first chamber ensemble in residence at the Vancouver Academy of Music. In 2013, Mr. Elworthy was appointed as Western Music Advisor for the newly established Haw Par Music Foundation – a collaborative educational initiative linking Vancouver and Hong Kong. Joseph Elworthy was a member of the Vancouver Symphony Orchestra for 12 years before retiring from the orchestra in 2014. Joseph plays on a rare Ferdinando Gagliano circa 1760 that once belonged to the legendary German cellist, Hugo Becker.